In recent years, the world has seen unprecedented attention and political commitment to addressing malnutrition. As nutrition rapidly rises on the global agenda, guidance is urgently needed on how to design, implement, and evaluate nutrition-enhancing policies and interventions. 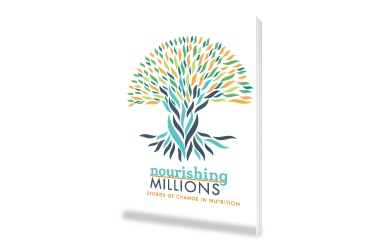 Nourishing Millions: Stories of Change in Nutrition brings together the most intriguing stories about improving nutrition from the past five decades. These stories provide insight into what works in nutrition, what does not, and the factors that contribute to success. Nourishing Millions contributes to IFPRI’s Compact2025 initiative and complements the A4NH-supported Transform Nutrition initiative, particularly its Stories of Change project. This book is edited by Stuart Gillespie, Judith Hodge, Sivan Yosef, and Rajul Pandya-Lorch. The book will be launched in the U.S. at the IFPRI headquarters in Washington, DC on June 29, 2016 from 12:15-1:45pm (EST), and will feature highlights from the book followed by discussion on how to scale up as well as accelerate progress on nutrition. Copies of the book will be available at the event.